This will be my wrap up post for the Marine Corps Marathon and the trip to DC. Running the race was one of the most rewarding experiences I have ever done. The thrill of crossing the starting line and feeling the energy of the crowd gave me goose bumps. I'll never forget climbing the hill in Rosslyn at mile 2 or the streets of Georgetown around miles 8 & 9. Running along the Potomac River starting at mile 10 was nice and flat. 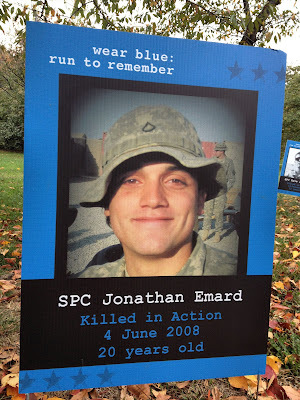 Seeing pictures of fallen soldiers, including Spc Emard from Terrell, at mile 12 was emotional and gave me needed encouragement to continue. Once we reached the National Mall near the Washington Monument at mile 17 I knew I would be able to make the Gauntlet time requirement. Running past the Capital building was surreal and after running past the Smithsonian and the Department of Agriculture at mile 19, the only tough part left was "beating the bridge". You had to reach the 14th street bridge by 1:05pm in order to be allowed finish. I reached the bridge in plenty of time. From there to the finish I did a speed walk more than a run. I was cramping in my thighs and quads but it wasn't that painful. Miles 21-24 were through Crystal City, lots of spectators, but my thoughts were really only about finishing. We ran around the Pentagon and past the staging area through mile 25, by then it started to hit me that I was going to finish. Before even hitting mile 26 I could hear the music at the finish. I was able to find a little energy and tackle the last hill and turn to the finish line where I was greeted by a Marine Lt. who put the finishers medal around my neck and gave me a salute. I cant even describe the feelings I was having, just unreal. From there I made my way to the photo area, got my picture taken and let it sink in that I just finished a marathon. Next up, rest and a 26.2 tattoo. Monday was supposed to be a sight seeing day, but Sandy forced us to leave early Monday morning. I stopped long enough to take a picture of the Capital building. Spec. 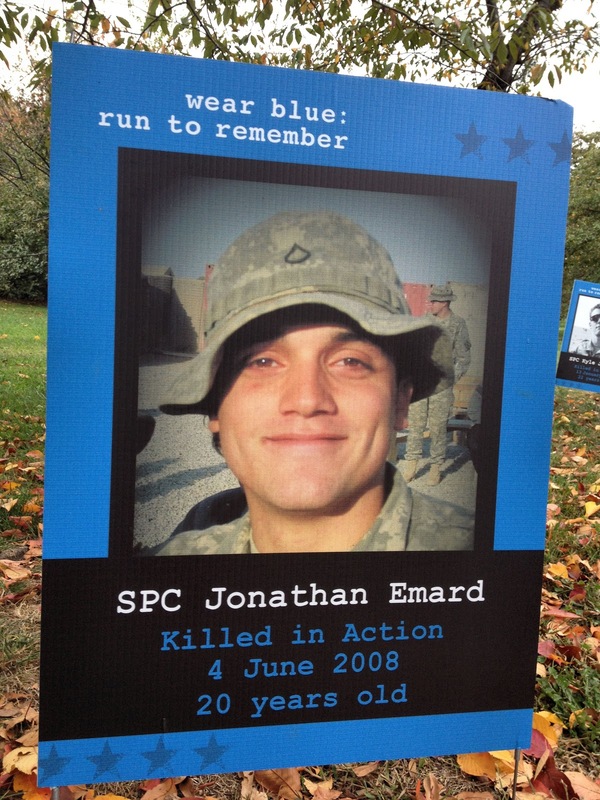 Emard was killed in action on June 4, 2008. This picture was placed along the race course around mile 12. One of only about 25.